City clerk Devon Reid speaks. Reid said the number of Freedom of Information Act requests made in Evanston reached a record high of 1,300. The number of Freedom of Information Act requests made in Evanston reached a record high of 1,300 this year. This follows a steady growth of requests since 2016, according to information from the city clerk’s office. An October report said the city received 759 requests in 2016 and 924 requests in 2017. 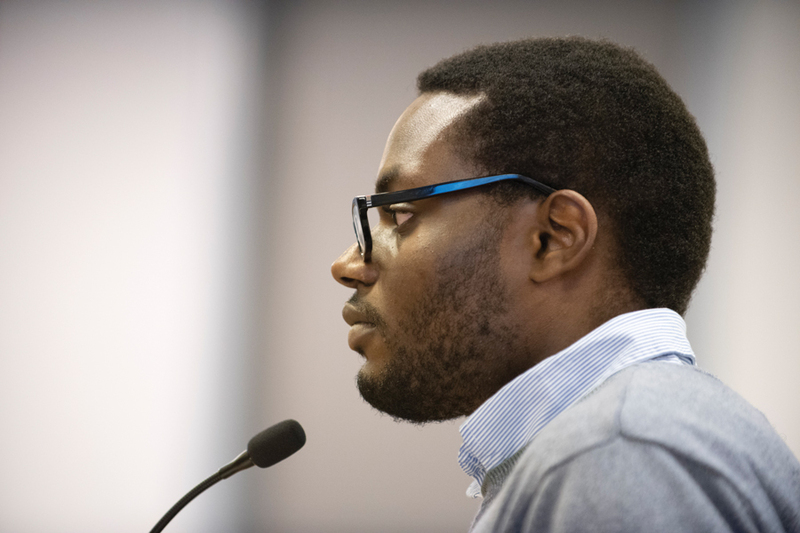 Almost half of those requests go to the Evanston Police Department, but the information technology department has seen the most drastic increase in requests, city clerk Devon Reid said. Reid said the increase in FOIA requests has partly to do with his focus on expanding access to city records. Resident and former interim deputy city clerk Bobby Burns said recent high profile cases in Chicago — in which key evidence was revealed through FOIA usage — could have contributed to the increase of requests in Evanston. For example, he said, the video released of Laquan McDonald’s shooting led to the conviction of police officer Jason Van Dyke. Burns has filed 10 FOIA requests himself, all within the past two years. He recently filed a FOIA request regarding the public record services in Evanston. “I’m very concerned about a decision that was made to keep the public records in the Health and Human Services department…I’ve been trying to understand…and hopefully build a case as to why (the records) should be in the clerk’s office,” said Burns. As of Oct. 1, the public can see all FOIA requests made on the NextRequest system. The information is still only released to the requester and remains private, allowing for duplicate requests. Reid said the change streamlines the FOIA process: If a resident now points to the previous request made, the resident can skip the five-to-10-day wait and receive the appropriate documents almost immediately. “While under the new system, the raw number of FOIA numbers may not decrease — we are saving staff time,” Reid said. Ald. Donald Wilson (4th) said Reid has been very engaged with people interested in more information. But Wilson said there are some instances in which residents won’t check to see what data is already public before they submit a FOIA request. “People don’t realize how much information is readily available through the city website…I’m not sure if people are starting with that,” Wilson said. Despite the increase in requests, the response time has actually decreased by one day, Reid said. He added that the city almost always responds within five to 10 days, unless an extension is needed for a complicated situation.